The CORE mount utilizes the familiar picatinny rail system and has been designed from the outset with flexibility and ease of use in mind. Construction is rock solid, with a quality of fit and finish comparable, if not better, than leading accessory and rail manufacturers. I was recently able to test one of the first CORE units released with a variety of optics and accessories and am pleased to say that this is the system many of you may be looking for! The CORE system comes in a nice plastic case with everything you need, including a set of good, detailed instructions. Before using the system, I highly recommend reading through these and familiarizing yourself with all the parts. I was pleasantly surprised to find that the company included the tools need for mounting and adjustments. They have been thoughtful enough to include a small tube of loctite as well! This may seem to be a minor point, but to me, it shows that the company has thought about how the purchaser will use the product from start to finish. According to SideArmor, the unit is made from 6061 aluminum and type 3 hard anodized. The fit and finish on this product is superb! Machining is to exact tolerances (yet parts move smoothly), everything is solid, with no stray tool marks, burrs, or deformations instilling great confidence in the product. Holes in the rails for the attachment screws are also countersunk so that the screws will fit flush with the base of the rail. Unload your firearm and double check to make sure it is clear. Clean off the outside of the barrel to remove any oil, dust, or debris that may be present. The mount proper has 3 main pieces. 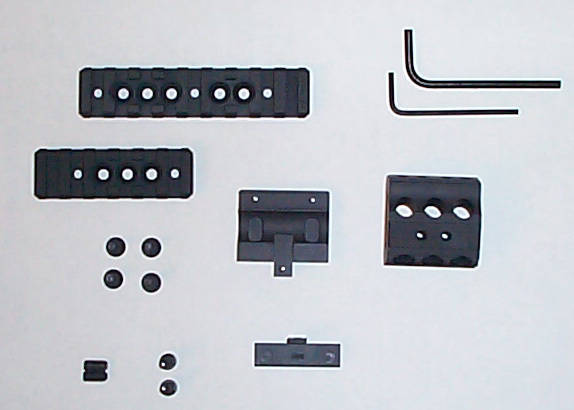 The main body to which the rails attach, the bottom plate, and the barrel clamp which fits in between the two. The top piece has 3 stainless pins protruding that line up the bottom piece, and also serves as a retainer for the locking piece so that it doesn't slip or fall through. The top piece is first placed on the barrel, the clamp placed over the guide pin, and then the bottom plate aligned with the 3 pins. This multipart construction means you do NOT have to remove the flashhider or other muzzle attachments to install the mount . . . nice! The bottom plate is secured with 2 larger sized hex screws. Once that is done, two smaller hex screws are used to tighten the barrel clamp against the barrel. The mount comes with a long rail and a short rail. These can be mounted on the top, left, or right side of the mount. Since there are 3 possible locations, additional rails, or a combination of different sized rails can be ordered (e.g. 3 long rails, 2 short + 1 long, etc.). The rails also have multiple holes so that you can position them fore and aft to a degree relative to the mount. Since there are different rail positions available, I would recommend trying them first before applying loctite to the screws. There is no problem fitting the unit to the 16" and 20" barrels. The exception to this is if you have a 20" barrel that was reduced to a 16" barrel length (GSI did this at the request of a number of AUG owners back in the day) as the the threaded portion is too thick to allow mounting. Again, the same barrel thickness reduction solution is available if you want to use the mount with one of these barrels. The mount will also work with the 9mm barrel if you don't mind tweaking it a little. The 9mm barrel has a thinner outer diameter than the standard AUG barrels. The barrel clamp on the mount is given a certain amount of movement and kept from falling by a pin. 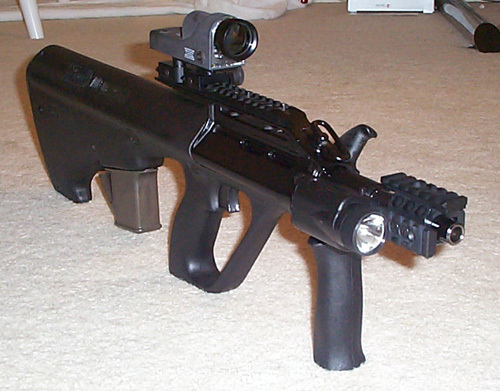 This setup works great and keeps you from cursing while working with a standard AUG barrel. What I did was dremel off the back end of this piece so that is was free to move in more and lock into the 9mm barrel. This required a little juggling as the piece was then free to slip out while positioning the mount. After a little bit of balancing, I got the mount the way I wanted and it would turn out to be well worth the effort! Now for the fun part! My first concern was whether the grip on the AUG could still fold up. No problem there! It has been designed with this in mind. The second check involved making sure the gas adjustment was still accessible. No problems with this either. Using both the M3 and M6 units, I found that they could in fact be mounted above the barrel without obstructing the view through the standard optics. 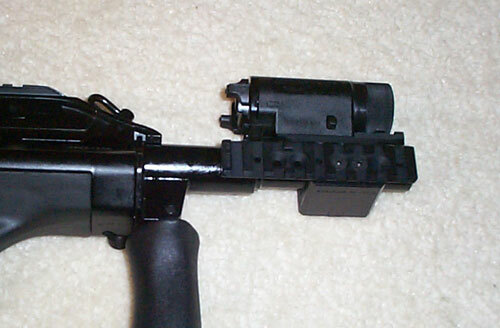 This is a real plus since your laser, light, or whatever you choose to use is aligned with the barrel. Next, came the ACOG which sits a little lower than the standard optics. Even the taller M6 did not block the view through the ACOG. Switching to the Reflex, I found that the accessories could be seen in the lower part of the sight, but the aiming dot was still perfectly visible and unobstructed. This might be a nuisance to some, but the sight is still fully functional. If this is an issue, you always have 2 other mounting positions available. Furthermore, if you don't mind having your grip always in the down position, you can rotate the mount so that you have a rail on the bottom. As a final test, I completely removed the rail from the AUG, and mounted the Reflex on the top rail. This configuration actually worked since the sight was high up enough for the sight to be visible. I suppose someone could use this setup if they have and interest in keeping the overall gun size down. The rest of my testing was done with the 9mm AUG and Trijicon Reflex sight. In terms of positioning, I preferred using the side rails rather than the top rail simply because it was easier to reach the on/off switches of what I had available. A remote pressure switch would make above barrel mounting much more appealing. I found that by using the long rail on the right side, I could use my thumb to easily and naturally manipulate the switch in to either momentary or constant on. I felt this was a good choice for the 9mm setup since there is no gas system to worry about, and it left maximum clearance for manipulating the cocking handle on the left side. The short rail could then be used with a laser or other item. If used on the left side, I found it relatively easy to use my left trigger finger to do the same. Although the Insight M6 contains both laser and light, I would prefer to use a M3 light on the right side, and a pressure switch activated laser on top of the barrel. In my opinion, this setup would be faster and easier to use. The third rail could then be used with an IR light or different type of laser if this is a requirement. Even if you don't end up using more than one rail, it is nice to know the option is there and that the system can grow with your needs. Test firing the unit turned up no surprises. Target acquisition was still quick and natural. 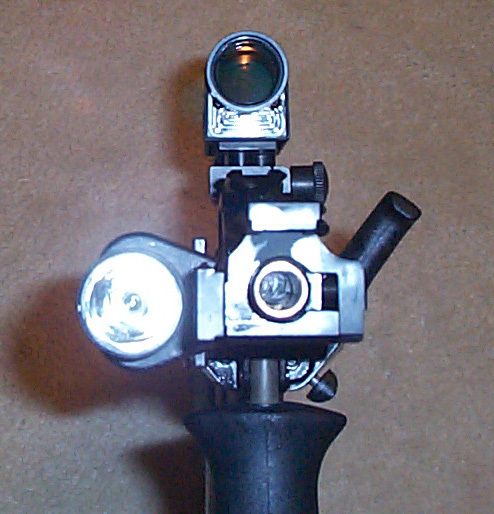 The combination of lightweight white light and the lightweight of the mount hardly changed the balance of the gun. Operating the light to briefly illuminate the target and shoot was a breeze and exactly what I was looking for in this system. The profile of the mount did not interfere with administrative handling and cleaning of the gun, although I would recommend removing rails not in use to prevent possibly snagging something on the exposed rails. The mount itself did not show any signs of movement after firing 500 rounds of firing, cleaning, and general use. I like the system enough that I am keeping mine. In my opinion, this is the most flexible and best designed system I have seen for use with the AUG. It is a well thought out, and an extremely well executed design worth consideration by any AUG owner that wants to mount a light or any other accessory. While a basic barrel clamp would serve the purpose of mounting a light, it does not have the same flexibility offered by a rail system. I liked being able to use the compact M3 light, and position it where it was easy for me to access and quickly remove/attach if needed.